As more traditional crops in Florida are challenged by pests and diseases, increasing costs, and foreign competition, growers are looking for alternatives to diversify their operations. During the 2015 Florida Ag Expo, Dr. Zhanao Deng, a Professor of Ornamental Plant Breeding and Genetics, presented his research regarding the potential of growing pomegranates, blackberries, and hops in the state. Deng told attendees that pomegranates have several market advantages. They have grown in popularity due to their health benefits. And, there is very little production of the fruit in the Southeast. California is the major growing region with 30,000 acres. Researchers are testing different varieties to see which ones might fit Florida’s climate and soils best. The biggest challenge to overcome will be the crop’s susceptibility to a number of diseases in the state’s subtropical environment. Leaf spots and blights can cause severe early defoliation, fruit rot, drop, and mummification. The good news is there are many varieties of the ancient crop, some of which, researchers hope will be more suitable to Florida’s climate and therefore a viable commercial venture in the future. A number of U-Pick farms already are having success growing the crop in the state. The popularity of microbreweries is creating demand for the crop because brewmasters want to promote the “buy local” angle of their beers. 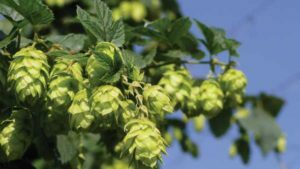 The biggest challenges to producing hops in Florida are related to climate and daylight requirements. Most are grown in Oregon and Washington where daylight hours are longer. Deng said research is the early stages to determine the viability of growing hops in the state.